Caption: Logging crew of the old sawmill at Heron, Montana. Howard Jenkins, John Jenkins and two friends, Bob Jenkins and Pete Penner. Courtesy Ellen Jenkins Innes collection. In 1920, very primitive roads were still the rule in western Sanders county. And it was true that political favor was the ticket to eliciting funds for any improvement. Much of the work was through individual effort and any expenditure of public funds was loudly proclaimed. "The old roads had the telephone poles along the roads painted so people would know they were on the right road," Johnny Knutson said. It wasn't always easy to tell, main roads being almost as rustic as the side roads."*1. About the end of March, while the ground was softened and workable by spring thaws, Herb Harris completed his road work on the west side of Bull river.*2. The forest service was also building road this season in the Bull River valley up toward Squaw Peak. "The Bull River road, which is entirely within the Cabinet forest with 51 people residing in that valley, will be greatly benefited by an appropriation allowed by the Forest Service giving $1,000.00 this year for improving two miles of this road running through Secs. 11 and 12, Twp, 27, R. 33. "This road is the only one running north and south connecting the Clark's Fork valley with the Kootenai valley. People traveling west on the northern transcontinental highway from Glacier Park to Kalispell, can shorten their route to Spokane approximately ten miles through the use of this road. The road connects two towns, Troy and Noxon. "Good fishing is to be had in Spar Lake, while Bull Lake is visited by many people on pleasure trips. The road is therefore of importance from a recreational standpoint. But its main importance is the connection of the two national highways and the Northern Pacific with the Great Northern railway. The county commissioners will also have, in connection with the Forest Service, considerable work in view on this important piece of road." Caption: Howard and Hazel Ellinwood's bridge across Bull River to the homestead they settled on in 1912. Note the pole decking on the bridge. May 1916. Courtesy Howard and Hazel Ellinwood collection. Frank Berray and George Baker rebuilt the road from Weare's place (on the North Fork of Bull River) south to the old Toothacker place. To improve the grade they moved it, going around the mountain instead of over it. "For $2.00 a day we hired a couple of fellas to cut the timber from the right of way. That cost us $50 to slice us a right-of-way," Frank said. "We really worked." They toiled practically all of that hot summer blowing stumps with dynamite, using a slip and one team of horses to move the rock and dirt.*3. Henry Larson and Urie Ellis represented Noxon when the county Good Roads Association met to protest the board of county commissioners spending $70,000 of the available $150,000 county road funds on one road - the Hot Springs-Dog Lake road. Representative citizens from all parts of the county met at Thompson Falls to bring their grievances directly before the board of county commissioners.*4. "In the meeting held at the courthouse ... Commissioner Prongua explained to those assembled that the reason for allowing such a large sum for the Plains-Hot Springs road was, first, its being a stage road; second, that it was the most traveled road in the county; and that the amounts allowed for the other projects - $40,000 for the Perma-Dixon project and $44,000 for the Belknap-Furlong project, was ... a fair and equal distribution of the funds available ... $35,000 available of the regular road fund would be used to gravel the main highways, and that all six of the trucks that had been used near Plains were through with that work this week and would proceed immediately to the most needed places for the purpose of graveling." "satisfactory compromise reached in which the county commissioners agreed to allow $50,000 for each of the three projects proposed, and everyone went home satisfied, feeling that this was the best that could be done under the circumstances. "... the federal aid does not seem to be much of a help as the specifications required to be fulfilled to secure federal aid requires a lot of money to build very few miles of road. Had the county commissioners the choice of using $75,000 to build good serviceable roads, a much greater stretch of good road could be built. As it is, $35,000 of regular road fund will be used over the county to repair the roads that become almost impassable at certain times of the year." In spite of years of hoopla and fuss, Noxon was still without a bridge in the spring of 1920, and thus totally dependent on their ferry crossing. The river is rising rapidly in May and if the approaches are not soon installed, they will not be able to run the Noxon ferry.*5. Everyone is to clean and repair roads, and give a day of voluntary labor. Caption: The Gordon's garden on their ranch on the north side of the Clark's Fork River, about four miles downstream from Noxon, at the base of the mountainside. Courtesy Granville and Pauline Gordon collection. And again, as focus was placed on their desperate needs for transportation, the settlers were not disappointed when the weekly newspaper headlines mounted yet another effort to get a bridge crossing for Noxonites.*6. "During the first twelve days of June the ferryman at Noxon made 550 trips across the Clark's Fork River with the rickety county ferry maintained at that place. Automobiles, trucks and wagons sometimes have to wait for a long time for their turn to cross. A number of years ago the people of Sanders County voted on a proposition for a bridge at Noxon. The proposition failed to carry and developments since would indicate that it was a serious mistake not to have built a bridge there. "In these days of auto travel the tourist takes the safest and easiest traveled road and thousands have been diverted from the Troy-Noxon road on account of there being no bridge at Noxon. But the tourist travel is the least of the inconvenience as the settlers and those engaged in the lumber and post industries are the greatest suffers. "The opportunity will be presented again to vote on the building of a bridge at Noxon and those interested trust that the proposition will be so placed before the people of the county that it will carry. It will be a particular advantage to every tax payer in the county to have the bridge, for without such improvements farming and other industries are retarded and property valuation kept from increasing. Tourist travel will also be diverted both to the north and south of us." Caption: Gathering out for a good Sunday afternoon, Circa 1917, at Bessie Knott's home. Emma Knott, unidentified, Emil Gavin, three unidentified guests, May Knott, Bessie Knott, and Georgia Nott. Courtesy Georgia Knott MacSpadden collectioin. "A tourist, whose name we are unable to learn, ran off the Stevens creek bridge near Tuscor, the hind wheels of the car going into the creek. He went for help and on returning he found that some dirty skunk had appropriated a new tire during his absence. This accident happened on a bad place on the public highway, which should be repaired. "$75,000 funds are not yet obtained ... federal government notifies it is available now ... as soon as Sanders county furnishes the same amount ... "The county commissioners will, at their next regular meeting in August, pass a resolution for the issuing of $75,000 worth of bonds and their sale. If these bonds are sold, $150,000 will be available for road building." At their August meeting, the County Commissioners resolved to put before the November electors the Noxon bridge proposal again.*7. As soon as they took action the newspaper editor was clearly on the side of their western neighbors, and with a series of articles he kept the spotlight on their needs. "One large car which ran off the ferry is at the bottom of the Clark's Fork. Get busy...vote for the bridge." Caption: A fine 1920 photograph of the Noxon ferry, two years before a bridge was built to cross the Clark's Fork River to the railhead town. The ferry crossing from the north side to the town on the south side. Courtesy Ruth Mercer McBee collection. In August 572 teams, 1713 autos and 364 pedestrians crossed on the Noxon ferry. An appropriation to build a bridge was to be put on the election ballot November 2, 1920.*8. "Sanders County is going to assist in construction of a new ferry at Noxon. The old pontoons will be taken to Smeads to be used on the Rhodes cable. (Rhodes had a ferry at Smeads)."*9. On September 6, 1920 the county finally sold $75,000 in road bonds at 6% interest. E. L. Deveraux & Company, Portland, Oregon was the buyer. "The long and tedious delay in the sale of these bonds was occasioned by the failure of the federal government to approve the project."*10. "40 acre farm for sale 6 miles west of Noxon; pretty good set of log buildings, fine spring, right on main road, 10 acres cleared; a snap at $880.00", told prospective buyers they'd soon have a bridge to Noxon.*11. It wasn't Anthony Wayne Saint's farm. Saint lived on Pilgrim Creek. He had doubts that the bridge would get built anytime soon, and that year he sold his ranch to H. J. Beal for $6,000.*12. Saint just shook his head when he read that by November a new bridge was completed on the Jocko River near Dixon, at a cost of $2,500, including the approaches.*13. However, at election time the authorization of the Noxon bridge carried by an overwhelming majority and encouraged the people of the west end of the county. They were grateful to their fellow Sanders county citizens for their assistance in getting the vote passed. Some of the bitterness derived from the struggle began to fade as other happenings took precedence. "The second pontoon of the new ferry boat at Noxon is nearing completion and it is expected that the complete boat will be ready for operation before Christmas. About seven inches of snow fell in this locality last week and sleighing bids fair for the winter. The new ferry will make it possible for James Saint to move 75,000 posts from Dry Creek, Ellis Brothers some 500,000 from the Rock Creek district while a number of smaller operators will be able to handle their posts and ties to the railroad without the delay experienced by the small capacity of the old ferry. "There is a move on to let the people of Smeads have the old ferry. A cable is already strung across the river and it would be a small job to attach the old ferry boat to it and give several families the opportunity to get their ties and posts to the railroad." By spring another conflict began to raise its ugly head. Noxonites, it seemed, along with the other residents of the west end, just couldn't come to agreement. Even their long sought bridge predicated another "ruckus". And provided another headline story for the newspaper. "A conference was held at the courthouse last week between a delegation of Noxon citizens and T. M. Keene of the Bureau of Good Roads, H. W. Holmes and W. M. Spann, two of the State Highway commission engineers. The object of the conference was to try to determine a site for the new Noxon bridge. "The Noxon group, comprised of about 50 representative citizens, strongly favor the Pilgrim Creek site. The engineers took the matter under advisement and will give a decision. Let us hope that our Noxon friends get what they want as they are the ones mostly concerned." "It has been reported that Geo. Phillips received $650.00 for a little more than two acres used by the county for a roadway to the proposed new bridge. If the highway engineer could not use the ferry site for the bridge because it was too low might they not condemn the present site because it is too 'high'?" Ethel Bartholomew began a lawsuit because she, too, owned land to the river's edge which would be crossed on both sides of the Clark's Fork River between the bridge site and town. Even though a sizeable part of her land on the north side consisted of a big hole around which the road to the bridge approaches would be built, Ethel got her money. 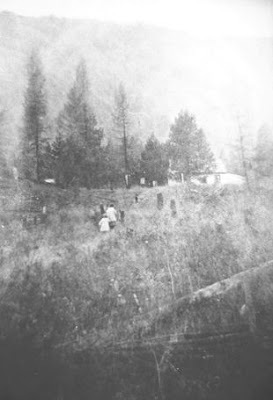 The Hampton children walking home west of Noxon, Montana. Courtesy Stewart and Agnes Hampton collection. ﻿﻿ Clifford Weare logged the pilings for the Noxon bridge from Government Creek. Portland Bridge Company built the bridge in 1922. R. E. Meath, contractor.15. When they were building the bridge Mr. Jamison fell off, and Wagner Dodge jumped in and got him out of the river.16. Ford Harvey was the first to drive across the bridge with a team of horses. (A claim made by others, but Ford stuck to his claim).17. After Lottie married Jim Finnigan it wasn't long before they had a Ford Model T car. In the summer time they drove to Clark's Fork where her parent's lived. "It took us an hour and a half to got from our ranch at Noxon which was 28 miles," her son, Carmen Moore said. "The main road from Noxon went down through Smeads and Heron and Cabinet and on down to cross the river at Clarks Fork. That was the only road. The same road went from Noxon east to Thompson Falls, up through Furlong [where Noxon dam is now] and over Tuscor Hill and crossed Martin Creek, through Tuscor, Larchwood and Trout Creek. The railroad grade, that the railroad used to run, on is a roadway now. Once the railroad had two lines going through the valley there. "Carmen explained, "The old road used to wind around through the brush and finally come out up at Thompson Falls at Prospect Creek and cross on a high iron bridge. Boy that was an awful fragile looking thing. "We had the Model T Ford. Everybody either had a Model T or an old Chevrolet. Some of them were new practically. But to go to Plains which is 70 miles. I remember one time we went to Plains to a track meet. We left at four o'clock in the morning to get up there at 9 o'clock when the track meet started. When it was over it was night when we got home again. "Usually we always had a flat tire along the way and had to fix that. We thought we were flying, to get over the road that fast. About 15-20 miles an hour was about as fast as you could move at any time," he said. "When we lived out on the ranch it was no trouble at all to hitch hike to town because that was the main road between Thompson Falls and Clarks Fork. Cars were going by every few minutes, it seemed like. Usually most of the people who traveled through were either salesmen or the local people who lived in Heron or Noxon or going back and forth like that. "You could get down on the road, and in a few minutes usually, someone would come by, who lived in Heron and you could bum a ride from them. Sometimes, though, you might have to walk halfway before somebody did come along. It made it better and people would stop and pick up people. Most of the cars were touring cars and there wasn't much trouble getting in and out of them. That made it nice for people who lived along the road at that time. "In the early 1920's, gasoline was brought up from Spokane in boxcars in iron barrels, dumped off at the depot and rolled down into the warehouse. Mr. Jenkins, who had the pool hall there then, and Mr. Larson, both, they had a Model T Ford pickup or little truck and they had a stonebolt (a platform or box with wooden runners used to haul things.) They'd go over there and roll the barrel on that little stonebolt. They had a pump deal that siphoned the gas over into their tanks under the sidewalk in front of each business. Gas was 33 cents a gallon."18. Caption: This aerial photo of Bull River entering the Clark's Fork River, taking in 1970 after Washington Water Power Company had both Cabinet Gorge Dam and Noxon Rapids Dam across the Clark's Fork River, shows existing and ealier roads. The view is looking upstream of both rivers. Montana Highway 200 crosses left to right. The road that curves below the large bridge across the mouth of Bull River is part of the original 1929 highway. East-West in about the center of the photo, the original wagon road follows the Kootenai Indian Trail, left to right. Slanting off to the north, up the Bull River valley, are both the orginal Bull River Road (right side of Bull River) and the newer Montana Highway 56, or Bull River Highway (left side of Bull River.) Waterflow drainages between the ridges of these steep-sloped rocky mountains may appear to be trails, but they're not. Courtesy U.S. Forest Service collection. Johnny Knutson, oral history 1970. Sanders County Independent Ledger, April 8, 1920. Frank Berray, tape-recorded oral history March 6, 1970. Sanders County Independent Ledger, May 6, 1920. Sanders County Independent Ledger, August 5, 1920. Sanders County Independent Ledger, October 7, 1920. Sanders County Independent Ledger, Octoer 7, 1920. Sanders County Independent Ledger, October 23, 1920. Sanders County Independent Ledger, November 11, 1920. Sanders County Independent Ledger, December 16, 1920. Clifford R. Weare, tape-recorded oral history. Lucy Jenkins, tape-recorded oral history February 2, 1970. U.S. Dept. of Transportation, Montana Division, Letter, March 24, 1972. In the spring of 1923 a survey was made from Weeksville to Thompson Falls, location for Forest Highway route 6, requested in 1916 by F. A. Silcox. Between then and 1930 a considerable amount of location survey was done on the route. Apparently construction began on Forest Highway portion during 1923 in Montana and in Idaho in 1921. The total highway would be to update the original 16-foot wagon road to an 18 foot "modern" highway. The Clark Fork highway, as such, began at Missoula and after climbing 700 feet over a low watershed between the Clark Fork and Flathead Rivers, fifteen miles out of Missoula, it gradually descended to the Flathead River at Dixon; following this stream to its confluence with the Clark Fork River near Paradise. From here it traverses the valley skirting the northerly end of Lake Pend'Oreille as it crosses the panhandle of Idaho to reach its western terminus at New Port, WA, 330 miles from Missoula." Carmen Moore, tape-recorded oral history, January 1988.